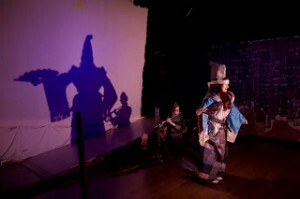 Theatre of Yugen is a San Francisco based ensemble of artists from North America, Europe, and Asia who create works of world theater influenced by the classical Japanese dramatic forms of Noh and Kyogen. Whether the subject matter is classical or contemporary, serious or comic, Theatre of Yugen strives to project the aesthetic quality of yugen, or mysterious elegance, which gives their work a distinctive style and provides a unique experience to their audience. Ensemble members receive training in the traditional Japanese Noh and Kyogen forms and engage with colleagues in the experimental arts community, incorporating other diverse performance styles and artistic media into their work. Theatre of Yugen is proud to have been part of the San Francisco arts scene for more than thirty years and to have established a national and international reputation through tours across the United States, Europe, and the Far East.